Never before in the history has technology been a driving force to define the way we do business. Today’s customer is more educated than every before and he is not looking at informer he’s looking at informal friend. Your buyer is socially connected, mobile and real-time informed. Digital marketing has collided the divide between Sales, Marketing, Branding, Business Development. You can only adapt or stay alive. Roles played by Sales and Marketing professionals are still the same but platforms and tools are different. Social selling is about leveraging your social network to nurturing lasting relationships amplifying trust to build sales pipeline and grow revenue. Social selling is change in approach to customer acquisition, retention, marketing strategy and sales funnel. Cold calling, emailing, brochures in mail are things of past and need to be blended with social selling approach.Traditional marketing’s blend with digital is ‘happy hour offer’ effect. We live in a world of Digital transformation. Sales and Marketing need to evolve with times. This Workshop will explain the new 4P’s of Marketing. How realtime marketing can change your sales funnel. The new rules of engagement and social media tools to help you grow revenue. This Workshop is for those professionals who want to be massively successful in growing their business. The only one way is Digital, which levels companies of any size and birth date. Social selling is the present and future for any business whether it be B2B or B2C. 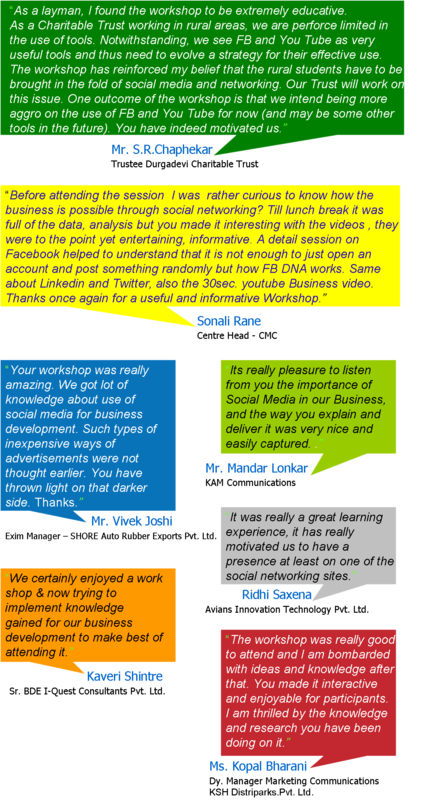 You have been using social media channels but the Workshop will each you to use it making business sense. This Workshop will cover every aspect of the buyers journey and techniques to achieve your goals in sales and marketing. Note – This is a Hands-on-workshop. It is mandatory to have a laptop with internet connection. Location – Sakal International Learning Center, Pune. 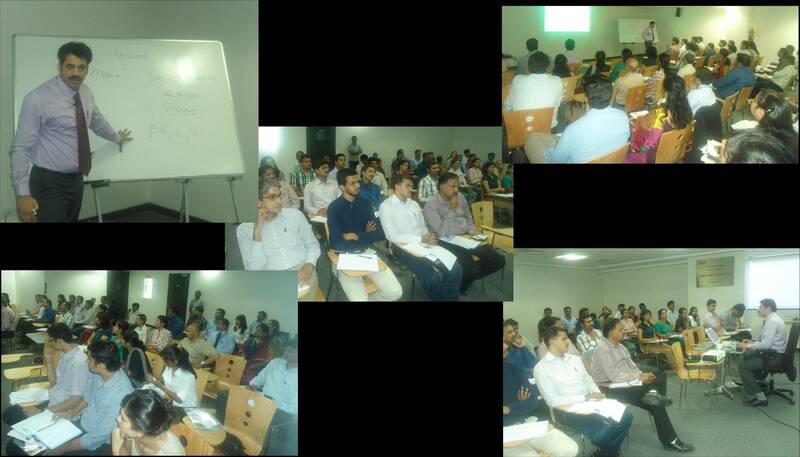 What happens when a Engineering College Dean, Corporate HR, Marketing Head, Business Owner of IT, Infrastructure companies come together for a One Day Social Media Marketing Workshop? Well check out for yourself in the review section.. It has always been a great experience in interacting with all my Workshop attendees who are leaders from different industries and are responsible for Business Growth. Thanks to the Chamber of Commerce for Endorsing me. 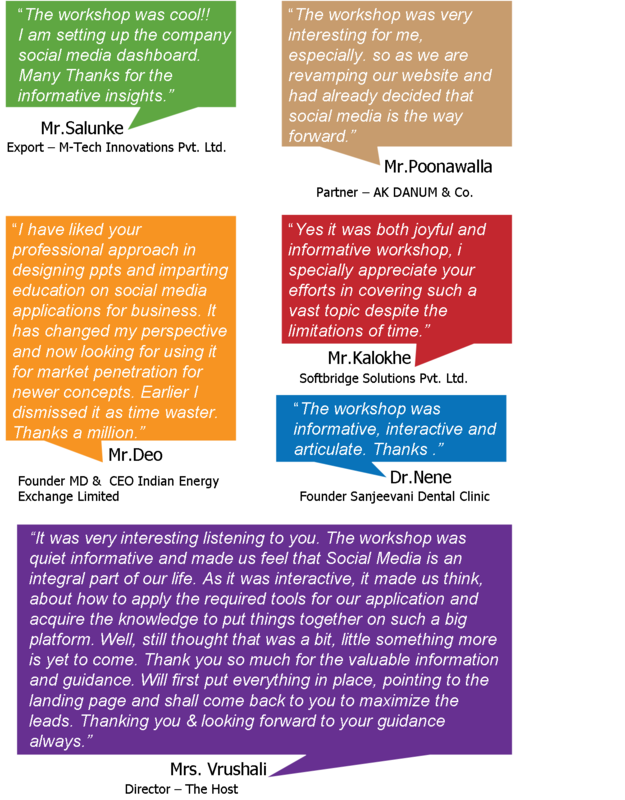 Here are some Customer testimonials for you to access the Results of my Workshop….. Enter your email address to stay updated on latest Social Media Marketing News. Join me on Facebook for latest updates. Feel free to browse through my earlier blogposts.